Thanks to a combination of free market competition, new developments, and generally silliness, there are more types of backpacks on the market than anybody ever needs. We’ll try to limit the discussion here to a few basic concepts, and then encourage you to make your own decisions. Frame: Internal, external, or none at all? 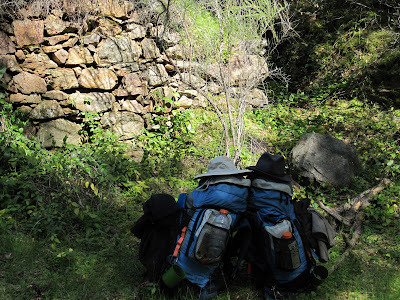 The basic question is whether you want a frame to help hold your pack together and in place, or not. And if you do, should that frame be inside or outside the pack? What does all this mean? Remember those old packs that you see in the movie Wild? The ones that have an aluminum frame and then some kind of nylon pack laced on the outside? See the photo at left? That’s an external frame pack. If yours has a good hip belt along with it, it probably works pretty well. 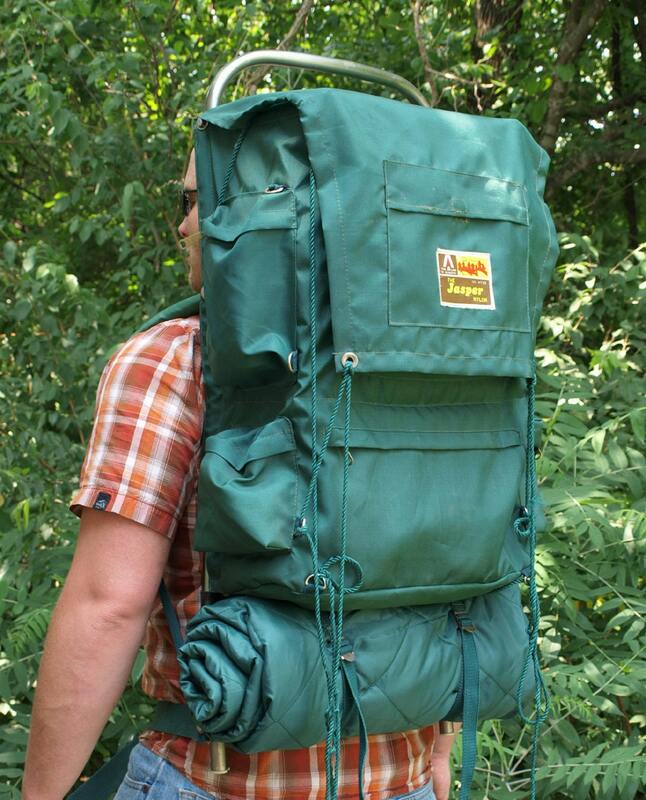 We used to have two Kelty packs from about 35 years ago that still only weighed about 3 ½ pounds. What more do you want? If you have one, there really isn’t much need to upgrade. And you can often get these at yard sales for almost nothing. Can’t beat that! The one drawback to our old packs was that our new sleeping bags and tent were so small that they weren’t easy to tie onto the lower part of the pack…where they belong. Still, that’s a minor quibble for something that weighs so little, costs so little, and works pretty well. And that top frame is a great way to pick up your pack--something that the new packs can't match. But after everyone bought an external frame pack, somebody needed to invent (or re-invent) new technology. Enter the internal frame pack. In these packs the frame is minimized (usually just a couple of aluminum or plastic bars to help the pack keep its shape) and fits inside the pack itself. The object is to create a pack that fits you better, and is better adapted to your body---so the bag doesn’t flop around quite so much behind you. It’s a good idea that we've borrowed from rock climbers, and if you can get one that doesn’t weigh a lot, it can work really well. For difficult off-trail hiking and climbing, where keeping your balance is important, they are absolutely the way to go. We’ve been very happy with our basic Eureka 3800 packs that we picked up at a discount store about ten years ago for under $50. They weigh the same as our old packs, and do fit our body better…we can adjust them so that M’s is pretty different from P’s. and both of us are happy. The one disadvantage is that these hug your back, which means that your back gets no ventilation...and P's shirts are always sopping wet on a warm day. The old packs were better at this, because they let your back breathe. You can now buy internal frame packs in sizes up to “bigger than you could ever carry on your back” and at prices up to “why don’t we just buy a horse?” They can carry 5500 cubic inches, weigh more than six and half pounds, and have a special compartment for musical instruments. (Just kidding.) Unless you are planning to hike the entire Pacific Crest Trail without a single re-provisioning break, you don’t need or want this pack. This is especially true for beginners, who tend to pack too much stuff anyway. When you have a big pack, you will fill it up. And then you will have to carry it. And that just might be enough to turn you off backpacking for the rest of your life. In fact, if you are really planning to do the kind of backpacking we do (up to about a week on the trail) you might look at the latest backpacks, which really are light. If you are willing to revise all your equipment to ultralight stuff, you might be able to get by with one of the new ultralight backpacks that have no frame at all. Yep—just like the backpack your kids take to school every day. Except that they are made with space age materials and weigh almost nothing. And if you don’t put too much into them, and baby them a little bit (these materials are not iron-clad!) they are a very interesting option. But they also cost a lot of money, and that isn't necessary until you really get into this stuff. The two packs above are the ones we use right now. We picked up a couple of nice 50L packs from Go-Lite before that company went out of business, and we've used them, ever since. And they weigh two pounds. They have tiny little stays inside, and work really well for us. But that leads us to the next point. One element that still encourages discussion around our house is the need for external pockets. Serious climbers, of course, don't like these, because if one catches on a stick just when you are making your critical move, it spells disaster. But if you are a serious climber, you probably don't want our advice anyway. M prefers more pockets because they allow her to organize her pack more clearly. She doesn't like having to open her pack every time she needs a tissue, or lip balm, or her camera, first aid kit, snacks, wilderness permit, or....you get the idea. P, on the other hand, doesn't quite see external pockets the same way. But he also often ties something to the outside of his pack--whether it be his camp shoes or a foam seat pad, or even his clean laundry hanging out to dry. Purists would be appalled. But that's OK with P. He's hiking, he's loving it, and he will have clean socks the next day. After than, it really depends on what you are going to put into it. If you have all ultralight gear, and your final trail weight is 14 pounds, then by all means go for one of those ultralights. If your trail weight is closer to 35 pounds on your longer trips (as ours is) then we would go with either a smaller internal or external frame pack. And if your trail weight is more than fifty pounds…we’d get a pack llama.